Cincinnati Reds first baseman Joey Votto reacted very calmly to being hit by a pitch during Tuesday night's game against Florida. It happened in the bottom of the sixth inning with the Reds holding a 6-0 lead. Marlins pitcher Wei-Yin Chen hit Votto in the ribs on the first pitch of his at-bat, but clearly there was no intent. 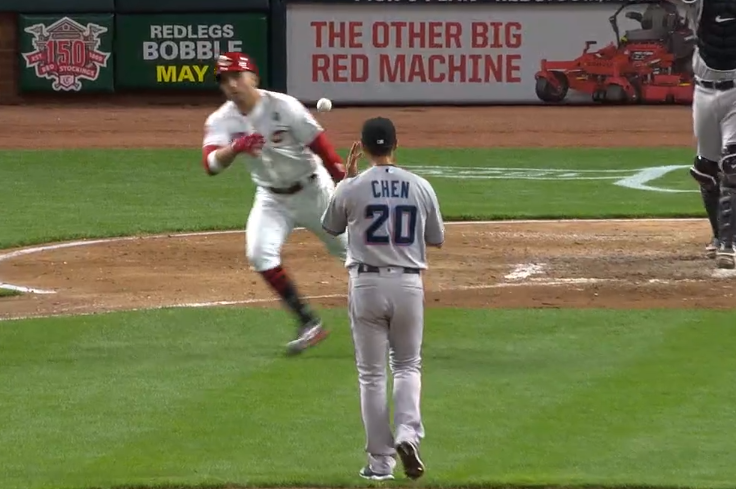 The ball bounced on the ground in front of home plate, and Votto simply picked it up and tossed it back to Chen before jogging over to first base. Matt Kemp came up next and homered to bring Votto home. Votto was taken out of the game after that, as the Reds scored 7 runs in the game on the way to a 14-0 blowout. Votto finished 1-for-3 with 2 runs scored.